The costal cartilages are bars of hyaline cartilage that serve to prolong the ribs forward and contribute to the elasticity of the walls of the thorax. Costal cartilage is only found at the anterior ends of the ribs, providing medial extension. Position of the costal cartilages (shown in red). Sternocostal and interchondral articulations. Anterior view. The first seven pairs are connected with the sternum; the next three are each articulated with the lower border of the cartilage of the preceding rib; the last two have pointed extremities, which end in the wall of the abdomen. Like the ribs, the costal cartilages vary in their length, breadth, and direction. They increase in length from the first to the seventh, then gradually decrease to the twelfth. Their breadth, as well as that of the intervals between them, diminishes from the first to the last. They are broad at their attachments to the ribs, and taper toward their sternal extremities, excepting the first two, which are of the same breadth throughout, and the sixth, seventh, and eighth, which are enlarged where their margins are in contact. They also vary in direction: the first descends a little to the sternum, the second is horizontal, the third ascends slightly, while the others are angular, following the course of the ribs for a short distance, and then ascending to the sternum or preceding cartilage. Each costal cartilage presents two surfaces, two borders, and two extremities. The anterior surface is convex, and looks forward and upward: that of the first gives attachment to the costoclavicular ligament and the subclavius muscle; those of the first six or seven at their sternal ends, to the pectoralis major. The others are covered by, and give partial attachment to, some of the flat muscles of the abdomen. The posterior surface is concave, and directed backward and downward; that of the first gives attachment to the sternothyroideus, those of the third to the sixth inclusive to the transversus thoracis muscle, and the six or seven inferior ones to the transversus abdominis muscle and the diaphragm. Of the two borders the superior is concave, the inferior convex; they afford attachment to the intercostales interni: the upper border of the sixth gives attachment also to the pectoralis major. The inferior borders of the sixth, seventh, eighth, and ninth cartilages present heel-like projections at the points of greatest convexity. These projections carry smooth oblong facets which articulate with facets on slight projections from the upper borders of the seventh, eighth, ninth, and tenth cartilages, respectively. The lateral end of each cartilage is continuous with the osseous tissue of the rib to which it belongs. 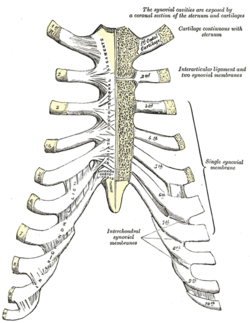 The medial end of the first is continuous with the sternum; the medial ends of the six succeeding ones are rounded and are received into shallow concavities on the lateral margins of the sternum. The medial ends of the eighth, ninth, and tenth costal cartilages are pointed, and are connected each with the cartilage immediately above. Those of the eleventh and twelfth are pointed and free. In old age the costal cartilages are prone to undergo superficial ossification. Position of the costal cartilages (shown in red). Animation. Anterior surface of sternum and costal cartilages. Wikimedia Commons has media related to Costal cartilages.